Antoine Revoy is a French illustrator, cartoonist and graphic novelist, raised in Japan and based in the U.S. East Coast. Born in 1977 on Rue Gustave Doré in Paris, Antoine has lived, studied and worked in 7 countries on 3 continents and speaks 6 languages. 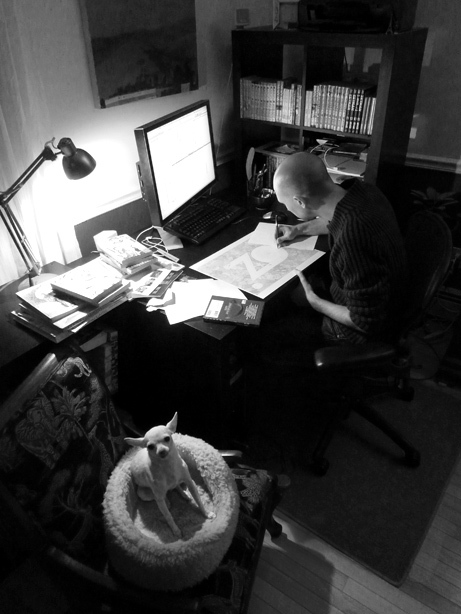 He is the writer and illustrator of the graphic novel ANIMUS. On the side of his activity as an artist, Antoine is also a teacher in RISD's Illustration Department, where he has twice been nominated for the school's Excellence in Teaching award (2015, 2017), and a thesis advisor for the MFA program at the School of Visual Arts in New York. He is also a writer for various publications on design and the creative industry. He lives and works in Providence, RI, with his wife, illustrator Kelly Murphy. BNP Paribas, Boyds Mills Press, Der Spiegel, First Second Books, Harvard University Press, Hasbro, Henry Holt and Co., Macmillan, The New York Times, PLANADVISER, Rhode Island School of Design, Samsonite, Scholastic, SquareFish, TEDMED, You?